easyJet is the UK’s leading airline currently offering over 990 routes, over 130 airports, across 31 countries. Carrying over 80 Million passengers a year, they attract customers from all over the world. Since launch, the site has generated over 2m bookings with improvements being seen on core target KPI’s across the board. 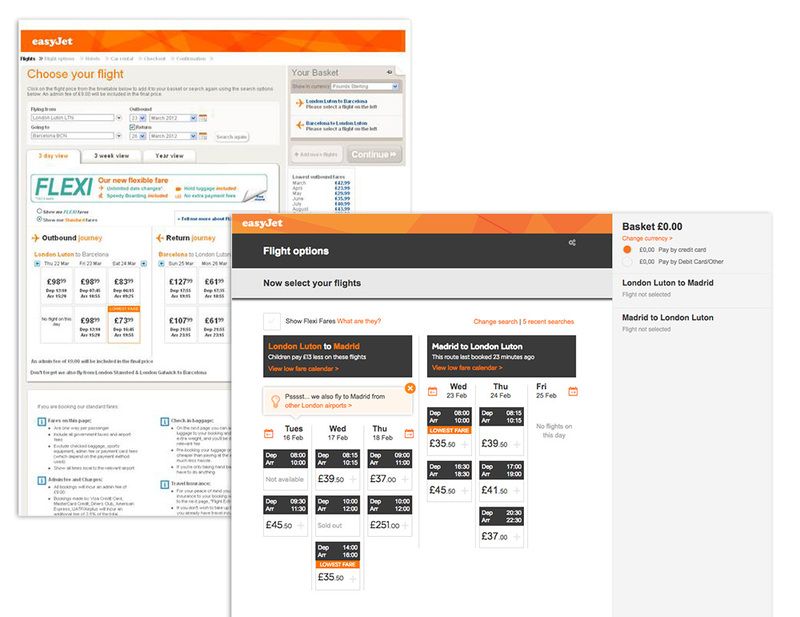 easyJet initially approached Bunnyfoot for a new framework for a series of responsive future facing templates that would allow for flexibility moving forward. From the success of the template framework, easyJet asked Bunnyfoot to build a fully responsive prototype for the easyJet booking journey. Bunnyfoot and easyJet aimed for a site that would work from a single codebase using any device with any screen size. The focus was on simplicity, scalability and mobile-first as a design principle. The project has involved Bunnyfoot consultants working collaboratively with the easyJet team, across all areas of the business to drive a user-centred design approach. Regular participatory design workshops were carried out with key stakeholders from around the organisation to involve them in the design process and to take them on the journey. Personas were also created to aid with the design decisions and participant recruitment. Early usability testing and an expert review were performed on the existing site to understand what worked well, what customers valued and where the major problems were. Some of the positive offerings were carried through to be included within the new site. The team then began working on designing templates. The templates were created as high fidelity clickable wireframes as this helped the development team who were rapidly developing code using an agile approach. Over 75 templates were created, each thoroughly usability tested and iterated upon with close to 20 rounds of testing over 3 years. During our iterative usability testing, we used a strict task tracking table so we could see across a series of standardised activities whether they were successful over multiple rounds and where changes needed to be made. E.g. something may have been fixed in round 2 of testing but this may have impacted another area so it was important to have this standardised. Usability testing was carried out in the Bunnyfoot Studios in London and Oxford with over 150 participants being recruited from personas using the Bunnyfield database. Major changes included a restructuring of the user journey to focus on the core products of flights, seat sale and adding checked-in baggage. Prior to the redesign, these add-ons were contained within an ‘extras’ page whereas now they can be presented as full steps within the journey. Bunnyfoot provided a full visual design for the live site working within easyJet’s brand guidelines and developed a library of over 100 font icons to ensure brand consistency by content creators moving forward. The new site was initially launched to a small percentage of traffic to monitor and optimize prior to the full launch to all the markets. Following rollout we continue to work on an extended programme of deliverables, creating further design and presentation improvements that can be tested, and optimized as part of a programme of ongoing improvement. Bunnyfoot draw on their in-depth knowledge of customers and our sector to challenge us with better solutions. Their style mirrors our own – can do, delivery focused and not a Frappuccino in sight! Or, come and visit us! We have offices in Oxford, Sheffield and London.